Newly remodeled four bedroom, two bath home right on the Lake, with an outside deck (12 x 16), with a wheelchair ramp. Small beach with shallow water at edge. Horseback ride in Cassopolis at Diamond-D-Ranch. Restaurants close by: Eddies Steak Shed 3.5 miles; 4 Square Bar 1 mile; Taco Bell 1 mile; McDonalds 1.5 miles; Bennigans, Texas Roadhouse, Olive Garden, Red Lobster, etc. 3 miles; Hardings Market 1 mile; Martins Supermarket 4 miles; Walmart 5 miles; Also, Garver Lake Golf Course 1 Block; Stables 2 blocks; Notre Dame 15 minutes away. Vacation Cancellation insurance is highly recommended. Very reasonable rates. There is an optional laundry cleaning fee of $75, and a grill cleaning fee of $75. Call Cathy to discuss the checks for these charges. Lots of seating with recliners and cup holders. Can rent one, and have delivered. Can rent boat and have delivered. Boat rides available on lake. The cottage was clean, comfortable and the weather was good. We need 4 bedrooms and they were all large enough for all our family. And of course the price was right. Thank you so much for the kind words! Look forward to seeing you again next year! Oh, dear, sorry if you found anything behind the furniture. We do try to keep it clean, and we are planning on replacing the floors this winter, so that will help, and we will find anything someone has left behind. I will admit I don't always look behind the furniture, as many times we don't have a lot of time during a switch out. We do try to have some really nice extras for people to enjoy. Cathy is a fantastic communicator and was very attentive to our questions when booking and when we arrived and also while on site. Everything was set for us when we arrived. There are a lot of rules posted, most of which we could ignore because we paid for cleaning. The TV instructions need to be posted, along with a list of channels and which of the 4 remote controllers to use. Location is ideal for Notre Game games. Bed count in the listing is confusing. There are five beds total in four rooms. This includes the bunk bed that counts as 2 beds, so if everyone wants their own bed, it sleeps 5. 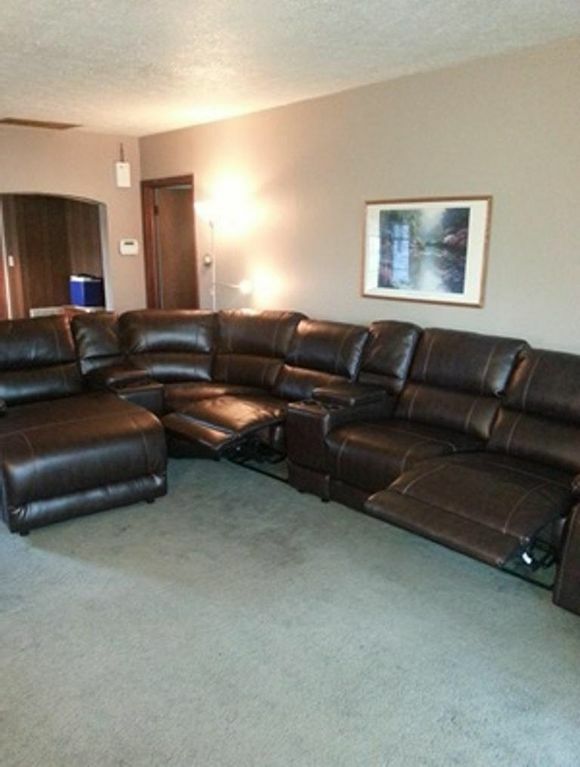 The sofa arrangement is huge and seats at least 10 people in a large great room with big TV. Washer and dryer a great plus. Two bathrooms were fine. Plenty of towels and linens. Several could sleep on the sofas if needed. I would not hesitate to rent again. Great time at the lake! Cathy's cottage was a great find on beautiful lake. Beds enough for our family of 8 adults and 3 children, a sand beach, a beautiful lake - it was fun and relaxing. Cathy is very helpful and checked in to see that the vacation was going smoothly. Thank you so much! You were great guests! Great beachfront on a quiet lake! We celebrated my dads 70th birthday here and had a blast. Dad & the boys fished the entire time, the kids swam and played in the sand and the rest of us lounged, kayaked (brought our own) and enjoyed the fire pit. The dogs had a lot of fun too! The cottage is just that, a cottage - reminiscent of the one we had when we were kids. Thanks for your hospitality and ensuring we had what we needed, Cathy! Winter sports-snowmobile trails, ice fishing, skating, snow-skiing one hour away, off season rates, Weekends available. Off season rates are negotiable. Also, if you would prefer to send a $300 damage deposit check to be held instead of buying the damage insurance, please let me know. Off season rates are negotiable. Contact owner. The $75.00 cleaning fee is refundable if you do your own cleaning including washing the sheets and making the beds. The $75.00 grill cleaning is also refundable. If you use the grill, please clean it. With purchase of Notre Dame weekend, can have extra nights for $100. Vacation cancellation insurance is highly recommended.